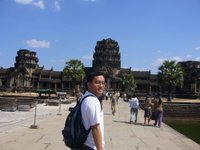 Angkor was the Capital of the Khmer Empire from 9th to 15th Centuries. From here a dynasty of Khmer Kings ruled one of the largest, most prosperous and most so phisticated kingdoms in the history of Southeast Asia, which in its heyday extended from the tip of the Indo-Chinese peninsula northwards to Yunnan and from Vietnam wesrwards to the Bay of Bengal. ANGKOR WAT, the most famous temple at angkor, as taken over by Theravada Buddist monks and became an important pilgrimage site. The remainder of the 'Lost City' had to wait until the arrival of the French colonial regime, when archaeologists began unravelling the mysteries of the past and embarked on a painstalking programme of reconstruction and restoration, which continues to this day.